FIGURE 9: Mating-type gene switching in budding yeast. 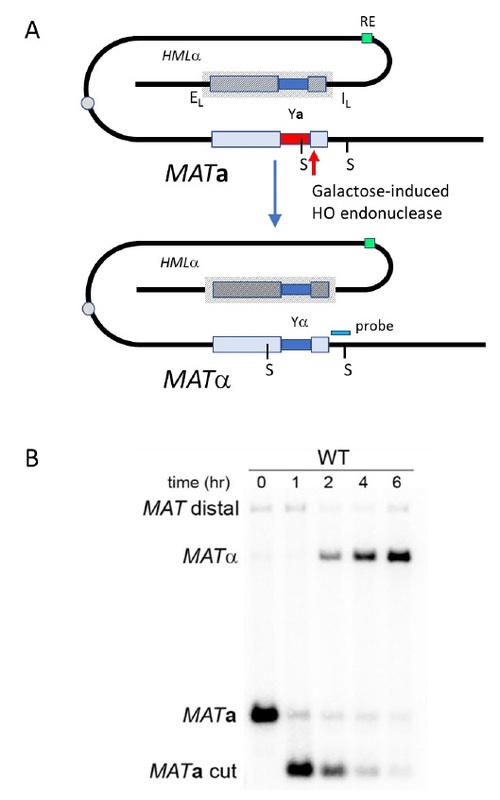 (A) Switching of MATa to MATα by homologous recombination between the HO endonuclease-cleaved MATa locus and the HMLα donor locus. Part of chromosome III is shown. HMLα and MATa are each about 100 kb from the centromere (circle). HMLα and the other donor, HMRa (not shown, at the opposite end of the same chromosome), are bounded by silencer sites (E and I) that create a highly ordered nucleosome structure (hatched lines) that makes the donors transcriptionally silent and prevents HO cleavage at the same α or a sequences that are present at MAT. A Recombination Enhancer (RE) facilitates the use of HMLα through Fkh1 protein binding both to RE and to sites near the DSB. StyI sites are indicated by S. (B) Kinetics of MAT switching. The cleavage of MATa is complete after inducing HO endonuclease for 60 min. Cleavage and subsequent steps are assayed on a Southern blot, using a MAT-distal sequence as probe (green). HO-induced cleavage of MATa is followed by the appearance of MATα, which has different StyI restriction sites and is thus easily distinguished from MATa. Here, the HMLα donor also harbors a single-base pair mutation that prevents subsequent HO cleavage.